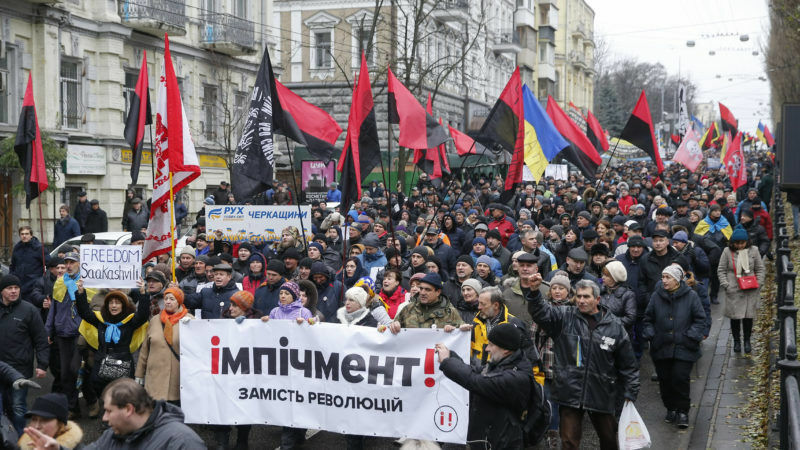 Several thousand people marched through central Kyiv on Sunday (10 December) to protest against the detention of Ukrainian opposition figure Mikheil Saakashvili and call for the impeachment of President Petro Poroshenko. Saakashvili, president of his native Georgia for nine years until 2013, moved to Ukraine after a popular uprising there and served under Poroshenko as a regional governor from 2015-2016, before falling out with the Ukrainian leader. He was detained in Kyiv on Friday, following a dramatic standoff earlier in the week where he clambered on a roof to avoid law enforcement and was freed from a police van by his supporters. He accuses the Ukrainian authorities of widespread corruption. Prosecutors accuse him of assisting a criminal organisation, charges he says were trumped up to undermine his political campaign against Poroshenko. A large number of police in riot gear guarded Sunday’s rally, which was peaceful in contrast with protests last week that resulted in clashes between Saakashvili’s supporters and law enforcement. “A lot of people are looking for change. It is more difficult when Mikheil is not with us,” his wife, Sandra Roelofs, said in a speech at the rally. “We remember his words: ‘When they catch me, you continue despite everything, because Ukraine wants change, Ukraine has to become a better country’,” she said. Protesters shouted ‘Shame’ and ‘Impeachment’ as they marched to Maidan square, the scene of the 2013-14 pro-European protests that ousted a Moscow-backed president and installed a new leadership that promised to eliminate entrenched corruption. A few snowballs were thrown at the windows of a branch of Roshen, the confectionary business owned by Poroshenko, who was a wealthy chocolatier before he went into politics. Saakashvili has launched a hunger strike to protest against his detention, which will last until a court rules on whether to release him under house arrest. The saga has attracted international attention to Ukraine at a time when the authorities face a chorus of criticism from reformers and foreign donors over perceived backtracking on reforms and attacks on anti-corruption institutions. While Saakashvili has a core base of supporters, he enjoys limited support across Ukraine. Only 1.7% of voters would support his party, the Movement of New Forces, in elections, according to an October survey by the Kyiv-based Razumkov Centre think tank. If you think that Americans cannot possibly care about fighting corruption in Ukraine & Eastern Europe, I have just one thing to say - Manafort. Ha-ha-ha! Only in Ukraine. A man literally breaks through the border into the country with the help of a mob, gets arrested, but then freed by the mob, gets arrested again, but the mob lays siege of the court and the judge releases him. Ukraine is now a country where the largest mob rules. Now, have a look at the photos of this mob and note a sea of red and black flags of the nazis from the “Right Sector” and add two and two together – Ukraine is now a country where fascists rule by brutal force of a mob. My congratulations to EU and US for yet another successful implementation of a “democracy”. andrej is right. This is the country we in the West engineered a coup d’etat to create: corrupt and unstable. The only redeeming feature, for the West, is that its government hates Russia. But is it really enough to make the grade for introduction into the Union? I don’t think so.